Business woman of the year winner Kim Beddoes during the Women in Business 2018 Annual Business Awards at the Grand Pacific Hotel on May 4,2018.Photo:Simione Haravanua. 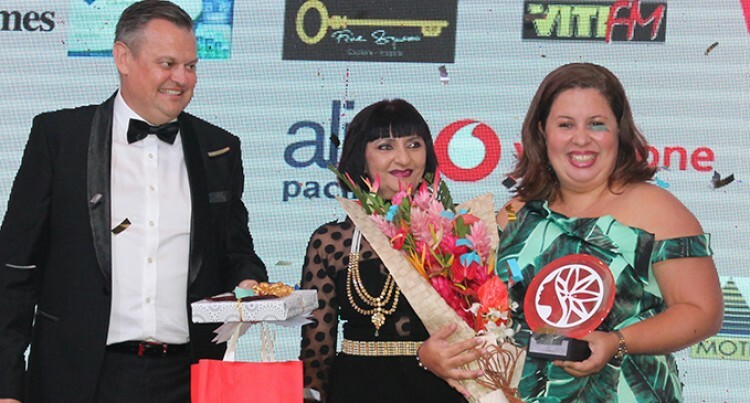 It was a proud and an exciting moment for Kim Beddoes, who won the 2018 Westpac Business Woman of the Year award at Suva’s Grand Pacific Hotel last night. Ms Beddoes is the co-founder of Party and Events Fiji, a company which expertly plans and seamlessly manages events for their clients. She said the recognition meant so much to her and her staff. “I am very proud. This is my first award for Women In Business and I feel excited for achieving the award,” she said. “We have the passion to go above and beyond in producing the best. This is what drives us and this is the vision of our company. Party and Events Fiji, which has rapidly become one of Fiji’s leading event companies trusted by local and international corporate companies alike, has about 200 employees. “I would like to thank Westpac for the recognition of the works that I do. This is my first win and I am over the moon. This win is dedicated to hardworking staff of Party and Events Fiji,” she said.